We’d love your help. Let us know what’s wrong with this preview of Write Away by Elizabeth George. To ask other readers questions about Write Away, please sign up. Has anyone out there read this? 6/23/17 ... reading again ... bringing back to mind the wonderful advice Elizabeth offers on every page. Terrific book for any writer. Full of the techniques as well as the angst of writing. Ms. George is a meticulous writer; this book explains how she does it. I love reading Elizabeth George's novels. They are, as she calls them, literary mysteries. And they are masterfully plotted. But also contain a lot of scene-setting verbiage that I regularly skip. These passages often seem to take me away from, rather than closer to, the dramatic tension of the current characters and plot. But the passages remain in all of her best-selling books. So perhaps I should not have been surprised to find that she takes a great deal of time to craft those portions of the I love reading Elizabeth George's novels. They are, as she calls them, literary mysteries. And they are masterfully plotted. But also contain a lot of scene-setting verbiage that I regularly skip. These passages often seem to take me away from, rather than closer to, the dramatic tension of the current characters and plot. But the passages remain in all of her best-selling books. So perhaps I should not have been surprised to find that she takes a great deal of time to craft those portions of the novels. It turns out, for example, that she goes to England and takes pictures of every major setting in her novels. And writes key scenes while reviewing her notes. She is impressively disciplined in her research and writing process, and the description of how she actually writes HER kind of novel was fascinating. My biggest problem with this book though, is that she buries the lead. The interesting parts about her process are surrounded with a really boring English teacher like explanation of plot, character and setting. What we want to know is: How do you write your novels? What are your unique techniques/flaws/hangups? She reveals more in the small quotes in the head of each chapter than she does in 75% of the book. Her doubts, her daily fears, her huge admiration of other writers. This is what we crave - to learn about HER! She finally includes two very small chapters on how she works, and how she organizes her day. They are followed by her admission that she finds it tough to let go of her left-brain organized self to get to the right brained creativity of writing. And that she has always lacked a lot of confidence about her talent. No kidding! A more confident writer would have started with the personal, and used it as a jumping off point for the theory and definitions. So, a note to the author: as you write on p.168, Elizabeth, "when we care, we continue to read." I dropped this book twice early on because there was so little of your personality in it to motivate me to keep going. You are a best-selling writer who is hugely successful and anyone reading your book cares about YOU. Don't be afraid to put yourself front and center. This book seemed to have you hiding behind generic definitions way too long. George, Elizabeth. (2004) Write Away. New York: Harper Collins. There are a lot of how-to books on writing out there. If you haven’t read any, this one is a reasonable place to start. It’s easy to read, encouraging in tone, covers most of the basics, and has plenty of examples. George is a well-known writer of mysteries and thrillers, and a teacher of writing. She describes her personal understanding of writing fundamentals and her own writing process. The result is a solid overview for a beginning writer. On the down side, the information content is low and conversely, redundancy and irrelevance are high. That’s what makes the book easy to read, but a more experienced writer would be better off with a genre-specific how-to book, or a more rigorous treatment, such as “Writing Fiction: A Guide to Narrative Craft,” by Burroway and Stuckey-French. George offers a “Seven step story line” guide, based on common sense and apparently derived, as much modern writing method is, from Aristotle’s Poetics. In short, a story should have a beginning, a middle, and an end; the dramatic tension reaches an apex in the middle; the main character makes a critical choice that leads to a climactic confrontation, a reversal, an epiphany, and establishment of a new status quo. There’s nothing wrong with that formula. It seems like common knowledge, but maybe it isn’t if you’re just starting out. George’s examples are way, way too long, often two or three pages, when a couple of well-selected paragraphs would have done the trick. Most of the examples are extremely boring, almost unreadable, especially those taken from her own works, which is the majority of them. Hundreds and hundreds of words illustrate nothing but generic prose. The examples illustrating dialog are especially uninformative. These excessive excerpts seem like filler to me. When George gets down to specifics, which is not often, I usually found her explanations lacking. For example, concerning the difficult problem of creating a character’s voice, she says merely that the voice arises “naturally” from the character’s biography that you have previously written. At a very high level of abstraction, that’s true. A garbage man is not going to talk like an Oxford don. But an interesting voice does NOT arise “naturally” from a specific biography. It must be explicitly created by the author and George offers no clue about how one does that. The last third of the book covers George’s writing process, how she actually goes about writing a novel from start to finish. Most of that material is idiosyncratic and of little interest to anyone else. For example, she is extremely keen on researching locations for her novels. She flies off to Europe to make extensive tours of old castles, wineries, and government institutions. Nice work if you can get it. She takes photos and records her impressions. However, she never mentions why she does all this. Is a novel an exercise of the imagination or is it a travelogue? Yes, readers appreciate accuracy, but for a how-to book published in 2004, this one seems curiously uninformed about the virtues of internet searches. Besides, the best stories are about characters, and in some important sense, location hardly matters. Maybe this is one reason I do not enjoy George’s novels. I have found them to be long on costumes and scenery and short on character-based drama. I often find that in her novels, what’s at stake comes down to some wrinkle in family systems involving other siblings, half-siblings, long-lost siblings, twins, paternity, maternity, illegitimacy, abandonment, disownings, etc. Kinship relations are about as interesting to me as digestion. I’m sure others differ, as she is a best-selling author, so somebody likes that stuff. I find hope and encouragement in Elizabeth George's assertion that writing can be taught. For me, this means that writing is something I can learn, and can continue to improve as long as I put work into it. Elizabeth George's philosophy states that a writer will be published if they possess three qualities: talent, passion and discipline. I'm reminded, therefore, to focus on those qualities and nourish them. I've followed a process similar to George's: conduct research, profile characters, and pl I find hope and encouragement in Elizabeth George's assertion that writing can be taught. For me, this means that writing is something I can learn, and can continue to improve as long as I put work into it. Elizabeth George's philosophy states that a writer will be published if they possess three qualities: talent, passion and discipline. I'm reminded, therefore, to focus on those qualities and nourish them. I've followed a process similar to George's: conduct research, profile characters, and plot, all in advance. George says this the writer to focus on the art of writing. While I'm not likely to follow her step by step process, certain aspects of it appealed to me. I also loved that she included Bryce Courtenay's quote, "He who possesses bum glue wins." George gave examples from her own work on how to create settings that feel real. She described how she conducts research and intertwines actual and fictional settings. Her settings provide more than a background for her characters; settings can become another character in the story. I've enjoyed writing in the POV George calls “Shifting third person.” She writes a good summary of the pitfalls: 1) each different POV needs a subtle difference in voice and tone, 2) one must be careful about pace because too many narrators can slow the novel down. As a fan of Inspector Lynley, I was intrigued to read about Elizabeth George’s process and how she has developed her craft. I enjoyed the varied examples she shared from other authors too. I’ll always remember “bum glue.” I now like Lynley and Havers even more! (2.5 stars) Disappointing. Somehow the great ones who write about writing manage to speak mostly about other writers that they love (take Stephen King's On Writing, Orson Scott Card's How to Write Science Fiction & Fantasy, E.M. Forster's Aspects of the Novel, etc.). But when a writer who is much less known takes many an excerpt from her own novels to exemplify whatever she is discussing, I usually do not stick around too long. True, King and Card do make occasional references to their own n (2.5 stars) Disappointing. Somehow the great ones who write about writing manage to speak mostly about other writers that they love (take Stephen King's On Writing, Orson Scott Card's How to Write Science Fiction & Fantasy, E.M. Forster's Aspects of the Novel, etc.). But when a writer who is much less known takes many an excerpt from her own novels to exemplify whatever she is discussing, I usually do not stick around too long. True, King and Card do make occasional references to their own novels. But they do so to exemplify their struggle with problems that they faced and how they tried solving them. It's case studies, usually recounted with self-deprecating humor and a good dose of humility. Elizabeth George, on the other hand, seems to love letting you understand what a swell writer she is. It's funny, by comparison, that most pages written by Card could make you think that he is an avid, intelligent reader who has no pretensions to write himself. And many pages written by King have to do with the overall life-diet that can lead you to get your writing done, as a great coach would write. The real problem, though, is not ego. The truth is that Write Away reads too much like a book of "recipes" for writers (and not good ones). Indeed most of her own passages that Elizabeth George quotes (and some from other writers) smack of "writing". This is, in fact, a general problem facing creative writing in the USA, where it seems you cannot tell a story without giving every telling (sorry, showing) detail about every character and locale, without much care for the rhythm of the narration. The result is that you can almost hear the writer stopping and saying: "Ok, now let's do the description of the library". Great writers don't let you realize that it's written (think of Capote's unforgettable swan song Music for Chameleons, for instance). Or if they do, it's with such intelligence that you can actually take great pleasure in reading it (think of William Faulkner or George Eliot, for instance). First, it should be noted that less the unrealistic transfigured romanticism of the creative process than the rough and challenging way to a finished novel is relentlessly portrayed. Where other counselors tend to coquet with optimistic illusions, this work shows the hard and sometimes frustrating everyday life of a writer. It is safe to say that from the author's perspective, discipline seems even more important than talent. Indeed, a contentious issue in which Georges's systematic approach, however, breaks a gap for consistent development against overly spontaneous, creative writing. Nor is it the only way to follow the path it has embarked on, but it offers several options for solving problems. As a point of criticism, the overly excessive passages that she takes out for illustration from her novels are to mention. Shorter excerpts would undoubtedly have had the same benefit and above all left more room for further explanations and exercises. Even with the autobiographical details away from the writing process, less would have been up to the waiver more. The plot and character development are well-explained, which unfortunately often undergo a step-by-step treatment by motivated beginners. To counteract this danger is a concern of Georges, which emphasizes her with a particular focus on this problem. For people who prefer to work spontaneously and let things run their course and observe how plots, figures, and suspense slowly develop or sometimes radically change and hold nothing of too pedantic conception and structure, will find little help in this book. Those who are more focused on the creative process and the use of their original resources are advised to consult. On the other hand, planners who appreciate advice on well-structured exercise processes and meticulously trained work instructions and can learn from this for their work can find extensive suggestions. Thus, the specific research is presented step by step, illustrated and made comprehensibly, the working structure and the daily routine is illustrated by Georges and emphasizes the importance of structure and accuracy. It would be all too illusory to want to profile yourself in the free-spirited, creative field as well as in the pedantic elaboration. Because a lot depends on individual preferences and talents. From this point of view, the book does another valuable service. It animates due to its systematics to the consideration, to which camp one should count oneself. A fundamental and perhaps unprecedented trade-off involving no less than potential success or frustration. In the knowledge of the personal strengths and weaknesses, one should in their interest mercilessly deal with their way of working. Moreover, start to sift out the appropriate exercise and learning methods. With this widely diversified guidebook for more precise work, it is still possible to discover the potential for improvement and to gain insights into the everyday life of a writer and to find inspiration from that place. Vorab sei angemerkt, dass weniger die verklärte Romantik des kreativen Prozesses glorifiziert als mehr der steinige und schwierige Weg hin zu einem vollendeten Roman schonungslos dargestellt wird. Wo andere Ratgeber zur Kokettierung mit optimistischen Illusionen neigen, zeigt sich in diesem Werk der harte und mitunter auch frustrierende Alltag eines Schriftstellers. Man kann getrost sagen, dass aus dem Blickwinkel der Autorin betrachtet Disziplin noch wichtiger als Talent erscheint. Gewiss ein strittiges Thema, bei dem die systematische Herangehensweise Georges jedoch eine Bresche für die konsequente Erarbeitung wider allzu spontanem, kreativen Schreiben bricht. Auch stellt sie den von ihr beschrittenen Weg nie als einzige Option dar, sondern bietet mehrere Möglichkeiten für die Lösung von Problemstellungen. Als Kritikpunkt sind die allzu ausschweifenden Passagen, die sie zur Veranschaulichung aus ihren eigenen Romanen heraus nimmt, zu erwähnen. Kürzere Ausschnitte hätten gewiss den gleichen Nutzen gehabt und vor allem mehr Platz für weitere Erklärungen und Übungen gelassen. Auch bei den autobiografischen Details abseits des Schreibprozesses wäre weniger bis hin zum Verzicht darauf mehr gewesen. Gut erklärt sind Plot- und Charakterentwicklung, die eine leider häufig stiefkindliche Behandlung durch motivierte Anfänger erfahren. Gerade dieser Gefahr entgegen zu wirken ist ein Anliegen Georges, das sie mit einem besonderen Fokus auf diese Problemstellung hervorhebt. Für Menschen, die lieber spontan drauf los arbeiten und den Dingen ihren Lauf lassen und beobachten, wie sich Plot, Figuren und Spannungsbogen langsam entwickeln oder auch mal radikal verändern und die generell nichts von allzu pedantischer Konzeption und Struktur halten, wird sich wenig Hilfreiches in diesem Buch finden. Denen seien eher auf den kreativen Schaffungsprozess und die Nutzung der eigenen schöpferischen Ressourcen fokussiere Ratgeber empfohlen. Planer hingegen, die Ratschläge zu durchstrukturierten Übungsprozessen und minutiös durchexerzierten Arbeitsanleitungen schätzen und daraus für die eigene Arbeit lernen können, finden umfangreiche Anregungen. So wird die genaue Recherche Schritt für Schritt dargestellt, illustriert und nachvollziehbar gemacht, die Arbeitsstruktur und der Tagesablauf Georges veranschaulicht und die Wichtigkeit von Struktur und Genauigkeit betont. Es wäre allzu illusorisch sich sowohl im freigeistigen, kreativen Bereich als auch in der pedantischen Erarbeitung profilieren zu wollen. Denn vieles hängt mit individuellen Vorlieben und Talenten zusammen. Unter diesem Aspekt leistet das Buch einen weiteren wertvollen Dienst. Es animiert aufgrund seiner Systematik zur Überlegung, zu welchem Lager man sich selbst zählen sollte. Eine überaus wichtige und vielleicht bisher nicht erfolgte Abwägung, mit der nicht weniger als der potentielle Erfolg oder Frustration einhergehen. Im Wissen über die persönlichen Stärken und Schwächen sollte man sich im eigenen Interesse schonungslos mit der eigenen Arbeitsweise auseinander setzen. Und beginnen, die passenden Übungs- und Lernmethoden auszusieben. I taught with Elizabeth for 7 straight years at the Maui Writers Conference and we now both live on Whidbey Island, a few miles apart. She came and spoke to my last Writers Workshop here on the island and outlined her creative process and it was fascinating as she laid it out. She kept saying the #1 trait to be successful as a writer is the ability to be ruthless. What she meant was ruthless was oneself. To sit and work hard. The one common trait I see in every successful writer I know is the ab I taught with Elizabeth for 7 straight years at the Maui Writers Conference and we now both live on Whidbey Island, a few miles apart. She came and spoke to my last Writers Workshop here on the island and outlined her creative process and it was fascinating as she laid it out. She kept saying the #1 trait to be successful as a writer is the ability to be ruthless. What she meant was ruthless was oneself. To sit and work hard. The one common trait I see in every successful writer I know is the ability to work very hard. Note the title says "One Novelist's Approach". It's one reason I call my book on writing a Toolkit. I don't believe there are black or white, hard and fast rules. 1) When writing about writing, do not include as examples numerous lengthy excerpts from your own fiction books. Especially when the excerpts are so long that, by the end of them, the reader has forgotten the purpose of reading them in the first place. I find this objectionable in its tackiness. 2) When writing to writers about writing, do not assume that your readers do not know the difference between first and third person. This is inane. Rather than insulting everyone's intelligence, kindly direct said writer-hopefuls to a grammar course. This was a case of reading the right book at the right time for me. In Write Away, Elizabeth George describes her own process of creating a novel. Much of what she does is similar to what I've already discovered works for me. Reading her take on it has served to reinforce my own process and provided ideas for expanding on it. She uses some high quality passages from published novels (not just her own) to illustrate her points. This book might not be of as much help to a pantser, at least not in This was a case of reading the right book at the right time for me. 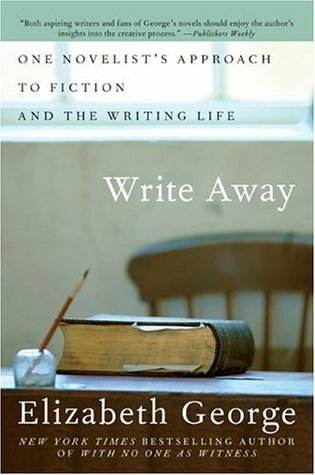 In Write Away, Elizabeth George describes her own process of creating a novel. Much of what she does is similar to what I've already discovered works for me. Reading her take on it has served to reinforce my own process and provided ideas for expanding on it. She uses some high quality passages from published novels (not just her own) to illustrate her points. I'm going to call it quits on this one--I made it through the first 50 pages. This book is directed mainly at people who want to write thriller/detective/murder type stories. This is not something I think applies to what I like to write, so for now, I find this book useless. The book contains long excerpts from the author's own novels as well as that of others. While I enjoyed to a degree the excerpts from To Kill a Mockingbird and Beloved (it actually makes me want to reread Beloved), the excer I'm going to call it quits on this one--I made it through the first 50 pages. This book is directed mainly at people who want to write thriller/detective/murder type stories. This is not something I think applies to what I like to write, so for now, I find this book useless. The book contains long excerpts from the author's own novels as well as that of others. While I enjoyed to a degree the excerpts from To Kill a Mockingbird and Beloved (it actually makes me want to reread Beloved), the excerpts about the authors own writing is boring and tedious. If I had tons of manuscript written, I would find this book more helpful. But since I don't it just makes me worry that writing is too hard and I'll never put in enough effort to do it for real. The book has a lot of nuts and bolts description about elements of writing that make stories work. Many lengthy examples from novels are included. My favorite parts are probably the quotes from George's personal journals that begin each chapter. I like knowing her own struggles with story, and her involve If I had tons of manuscript written, I would find this book more helpful. But since I don't it just makes me worry that writing is too hard and I'll never put in enough effort to do it for real. This is the second time I've read this, and it's one of those books that can teach you something new each time, depending where you are in your writing growth and career. Definitely a keeper. Very informative as I jump into writing my fifth novel... She is the most thorough instructor on plotting and character I have come across, insisting that it can all be learned and with hard work can be produced. We shall see. This book explained in great detail exactly how Ms. George writes her books. It is a college class on creative writing in paperback form. Fantastic. There are a lot of how-to books on writing out there. If you haven’t read any, this one is a good place to start. It’s easy to read, encouraging in tone, covers most of the basics, and has plenty of examples. George is a well-known writer of mysteries and thrillers, and a teacher of writing. On the down side, the information content is low and conversely, redundancy and irrelevance are high. That’s what makes the book easy to read, but a more experienced writer would be better off with a more ri There are a lot of how-to books on writing out there. If you haven’t read any, this one is a good place to start. It’s easy to read, encouraging in tone, covers most of the basics, and has plenty of examples. George is a well-known writer of mysteries and thrillers, and a teacher of writing. On the down side, the information content is low and conversely, redundancy and irrelevance are high. That’s what makes the book easy to read, but a more experienced writer would be better off with a more rigorous treatment, such as “Writing Fiction: A Guide to Narrative Craft,” by Burroway and Stuckey-French. George’s examples go on way, way too long, often for two or three pages, when a couple of well-selected paragraphs would have done the trick. Most of these examples are extremely boring, almost unreadable, especially those taken from her own work, which constitutes the majority of them. Hundreds and hundreds of words illustrate nothing but generic prose, not anything specific. The examples illustrating dialog are especially uninformative. It’s a shame, because one can think of numerous brief excerpts that could have been pulled from the canon to make very sharp points. When George gets down to specifics, which is not often, I usually found her explanations lacking. For example, concerning the difficult problem of creating a character’s voice, she says merely that the voice arises “naturally” from the character’s biography that you have previously written. At a very high level of abstraction, that’s true. The last third of the book covers George’s writing process, how she actually goes about writing a novel from start to finish. Most of that material is idiosyncratic and of little interest to anyone else. For example, she is extremely keen flying off to Europe to make extensive tours of old castles, wineries, and government institutions, as "research." Nice work if you can get it. Perhaps not un-coincidentally, I have found George’s novels to be long on costumes and scenery and short on character-based drama. But she's a best-selling author and I'm not, so what do I know? In my mind the rating varies between 3 and 3.5 stars. There are some very helpful advice in the book. The author makes it clear this is 'one novelist's approach to fiction and the writing life.' She gives an overview of the craft of writing, she goes over the basics, she treats some techniques. Then she goes over her own process, I found this the most interesting and enlightening part of the book. Part five goes over examples and guides of some of the author's own work. This is a double edged sw In my mind the rating varies between 3 and 3.5 stars. This is a double edged sword though. This is the third book about writing that I have read, but this is the first time I see an author quote so extensively from their own work. On the one hand I understand that they know their own work best, therefore the examples used of their own work can illuminate what they were trying to explain. On the other hand, it felt almost like she was trying to get the readers to read enough of her books to get them interested to go out and buy them. She does write mystery and thrillers... Sneaky. What I did not really appreciate, is her examples (from her own work) of bedroom scenes... It did not actually illuminate what she tried to explain, and I did not get this book to read about bedroom scenes. This is the first I heard of Elizabeth George, and I have never read any of her books. I can see that she is meticulous in her planning and plotting, also that she knows how to write, and she shows that she has discipline too. I guess her approach to writing would appeal to many authors starting out, and as I have said, there are helpful advice. She goes over some aspects that Stephen King ignored in his excellent book (On Writing). She also looks at some points from a different angle than what I learned from Brandon Sanderson in his excellent course (that can be found on Youtube,) about writing. Tämä oli todella ristiriitainen kirja. Kirjassa oli oivaltavia, kuivakkaan humoristisia huomioita ja havaintoja kirjoittamisesta ja kirjailijaelämästä, jotka tuntuivat arvokkaita, mutta niiden lisäksi kirja oli täytetty pahimmillaan yli kolmen sivun mittaisilla otteilla eri kirjoista, pääosin Georgen itsensä, mutta myös muiden kirjailijoiden teoksista. "Näin teet dialogia!" - sit kolme sivua romaanitekstiä. "Näin kuvaat paikkoja!" - lisää romaanitekstiä. Otteita oli todella paljon, ehkä jopa puo Tämä oli todella ristiriitainen kirja. Kirjassa oli oivaltavia, kuivakkaan humoristisia huomioita ja havaintoja kirjoittamisesta ja kirjailijaelämästä, jotka tuntuivat arvokkaita, mutta niiden lisäksi kirja oli täytetty pahimmillaan yli kolmen sivun mittaisilla otteilla eri kirjoista, pääosin Georgen itsensä, mutta myös muiden kirjailijoiden teoksista. "Näin teet dialogia!" - sit kolme sivua romaanitekstiä. "Näin kuvaat paikkoja!" - lisää romaanitekstiä. Otteita oli todella paljon, ehkä jopa puolet koko kirjan sivumäärästä, ja otteet olivat niin pitkiä, ettei niiden esimerkkivaikutus oikein kirkastunut, kun otetta lukiessa ehti unohtaa, että mitä asiaa nyt kirjailija halusikaan tässä kohtaa havainnollistaa. Jos kirjallisuusotteista olisi edes korostettu olennaisia kohtia, tai niitä olisi kommentoitu laajemmin kuin että "seuraavassa otteessa käytän takaumaa keskellä kappaletta", niistä olisi voinut saada irti enemmän. Nykyisellään teos oli lähinnä tilkkutäkki Georgen huomioita kirjoittamisesta ja satunnaisia irtopalasia romaaniteksteistä vailla kunnollista kontekstualisointia. Olen ostanut kirjan Dublinista Hodges&Figgis-kirjakaupan alennusmyynnistä vuonna 2006, ja näemmä meni 12 vuotta lukea se loppuun asti. Muistan kyllä aloittaneeni kirjan lukemisen jo matkalla, mutta hyydähtäneeni kesken niihin loputtoman pitkiin kirjallisuusotteisiin. Muistan aloittaneeni sen uudelleen pariinkin kertaan - alkupuolella kirjassa on itse asiassa hyvääkin settiä. Nyt sitten väkisin puskin sen sivu sivulta loppuun parissa päivässä. Jos joku muu tarttuu tähän, niin kehotan suoraan, että kirjallisuusotteet kannattaa suosiolla skipata. This was much more helpful to me than the book I read immediately prior, How to Grow a Novel: The Most Common Mistakes Writers Make and How to Overcome Them. George actually walks you through the painstaking process of how she crafts a novel, using a process I never could've dreamed of, involving imagining a small plot thread, creating in-depth character sheets, then writing scene summaries, and finally writing a freeform meta-narrative. All this before ever writing a sentence that will appear i This was much more helpful to me than the book I read immediately prior, How to Grow a Novel: The Most Common Mistakes Writers Make and How to Overcome Them. George actually walks you through the painstaking process of how she crafts a novel, using a process I never could've dreamed of, involving imagining a small plot thread, creating in-depth character sheets, then writing scene summaries, and finally writing a freeform meta-narrative. All this before ever writing a sentence that will appear in her novels! It's incredible to me that she does that much pre-work, but the more I think about it, the wiser that seems to me. Elizabeth George includes a lot of great examples to illustrate the techniques she describes about the writing process. I also really enjoyed that she laid out her own writing process with nothing to hide. I especially liked her distinction between doing leg work (my term, I forget what she calls it) and craft, wherein a lot of background work and planning must occur before the actual "craft" of writing happens. I feel like many writers expect that you'll just sit down at the computer and begin Elizabeth George includes a lot of great examples to illustrate the techniques she describes about the writing process. I also really enjoyed that she laid out her own writing process with nothing to hide. I especially liked her distinction between doing leg work (my term, I forget what she calls it) and craft, wherein a lot of background work and planning must occur before the actual "craft" of writing happens. I feel like many writers expect that you'll just sit down at the computer and begin writing and just go from there, which makes it incredibly easy to get writer's block and then never make any progress. Humorous at times, and always encouraging, George has a way of making you feel that she's right there with you, patting you on the shoulder, saying "Yes, dear, yes, let me tell you a time when I felt that way, too..." That said, sometimes I think she shares a little TOO much of her own process/experience, and occasionally crosses into the distasteful world of her own creative narcissism.